“A Fundoshi” is Japanese traditional underwear. The fundoshi was used as underwear for the man mainly. Originally cloth was expensive for the age of civil strife. The cloth of the fundoshi was used to check the social position of the person killed in action. As for the cloth used for cloth, hemp was mainstream. And use the cotton in the Edo era. In that way the fundoshi opened to a citizen. 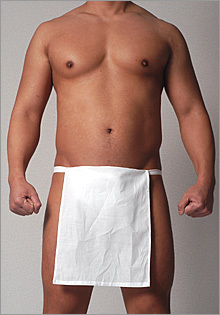 The fundoshi was used as main underwear of the Japanese adult male until World War II. Becoming it gradually goes ahead through the Western clothes, and new underwear such as briefs or the trunks appears. Some types are to the loincloth. There is a string in the both ends of the cloth. Called “a Classical underweae” and “samurai underwear”. It is at the both ends of the cloth through a string. The female-impersonator of Kabuki seems to always wear it. A thing using the cloth of bleached cotton. It is the fundoshi of the common T back type by a festival. There is not clamping of the rubber. You can overeat yourself !! After having operated for the stomach circumference for a disease, it is convenient. As the fundoshi has good ventilation, blood and the lymphatic flow improve and are underwear healthy at all. The good fundoshi is reviewed among young Japanese women recently. 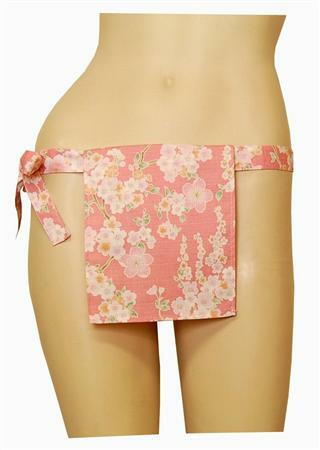 The stylish fundoshi for the woman is born. There is a feeling of opening and is popular among health-oriented women. The fundoshi thinks to a thing doing not have much woman. But, it is old, and there is the description that a woman wore a fundoshi in “the Chronicles of Japan”. You’ll never know unless you try !! The online shop of the store specializing in fundoshi in Harajuku. The fundoshi of this shop is superior in water absorptivity and water repellency. Therefore effective in suppressing the propagation of smell and various germs. It is good at the time of the going to bed that is easy to be sweaty !! Japanese toilets are number one in the world ! !